From new agent to experienced; from teams to top-producers, we have the support, technology, tools and culture that match every phase of your real estate career. We are your career brokerage. The Right Systems To Accelerate Your Growth. HomeSmart’s RealSmart Agent productivity software simplifies tasks and transactions -- at no cost to you -- so you can maximize your growth and earning potential. Get Rid Of Your Tech-Aches. You’ve got an open door to the best support in the business. Think of us as your personal partners in compliance, broker support and agent services. Don't Let Your Business Get Put On Hold. Structured for your learning style and busy schedule, we offer hundreds of online, live and on-demand trainings each year across our nationwide network. Get your business on the map. Locate your HomeSmart office. How Much Money Did You Give To Your Broker? 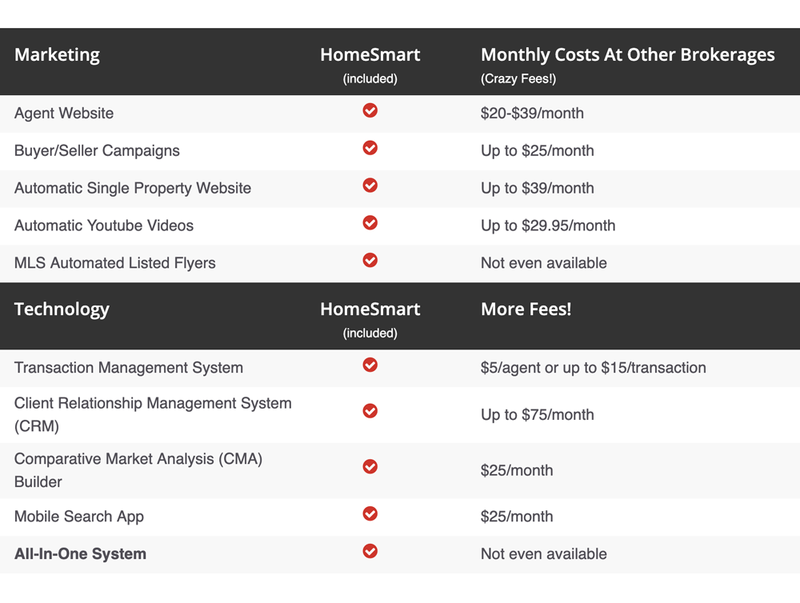 We’ll show you how much more you could’ve made with HomeSmart. When you keep 100% of your commission, you don’t have to wait to receive dividends from your hard work. Invest in your business by getting all of your real estate revenue working for you now. See What Our Agents Have To Say. Build Your Business By Reducing Your Expenses. Connect your career to a brokerage that has the support, technology, tools and culture that benefits you at every stage of your business.